“Increasing investment in biotherapeutic treatment forms a key part of Cancer Research UK’s research strategy. This exciting new initiative will give leading CRUK scientists access to the latest antibody engineering technologies and expertise, creating opportunities to translate breakthroughs in our understanding of cancer biology into urgently needed new cancer treatments.” Dr Nigel Blackburn, CRUK Director of Drug Development. 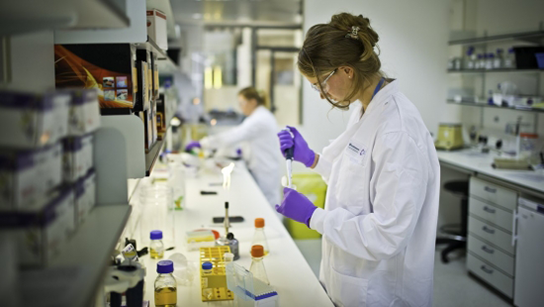 The laboratory brings together CRUK’s cancer biology expertise with the world-class antibody engineering technology of MedImmune, the global biologics research and development arm of AstraZeneca. Scientists from both organisations work side by side in the new joint laboratory in Cambridge, sharing knowledge and expertise to accelerate the discovery and development of novel biologics to treat and diagnose cancer. We invite researchers to apply to access this unique laboratory and expertise, to develop novel therapeutic and diagnostic antibodies. We are seeking promising new insights from novel biology through to well-validated targets, to underpin our discovery activities.